Send this letter to: The Federal Minister for Environment; the Premier of each State; the Minister for Environment in each State and the Departments responsible for wild animals in all states of Australia. I am writing to ask that you help protect kangaroos by imposing a moratorium on their commercial and non-commercial shooting. Those in support of the kangaroo killing industry maintain that kangaroos are pests. However, scientific studies did not find any evidence of red kangaroos competing with sheep for grazing or destroying wheat crops. A study by the CSIRO showed that kangaroos never visit 95 percent of wheat crops. Red kangaroo numbers are self-regulating and they do not need to be killed. Killing kangaroos for their meat and skin is cruel. Kangaroos are shot at night in the remote outback where nobody can monitor the shooting. The national "Code of Practice for the humane killing of kangaroos" is voluntary and there are no penalties tor not complying. Adult kangaroos are shot and dragged to trucks, struggling and still conscious. Some are still alive when their leg is cut open, a large hook inserted through the gash, and they are hauled up onto the truck. Their throat is slit and they bleed to death. Baby joeys are killed after their mothers are shot. The method of killing these baby animals is to chop off their head with an axe, or for them to receive a blow to the head with a heavy blunt instrument. Female kangaroos often have a joey who no longer lives in the pouch but still needs its mother for milk and protection from predation, as well as to learn life skills. When a shooter intrudes on a family unit and shoots the mother, this joey hops away frightened and will die a slow death due to starvation or capture by a predator. Killing kangaroos for meat and skin is unsustainable. Permits are issued based on aerial surveys of numbers of kangaroos. Only a third of the area in which the shooting is to be carried out is counted each year on a rotational basis. Kangaroos are mobile animals, but the count may be spread over three years. This means that an animal can be counted twice; hence it is possible to overestimate the population and therefore any quotas for killing purposes. 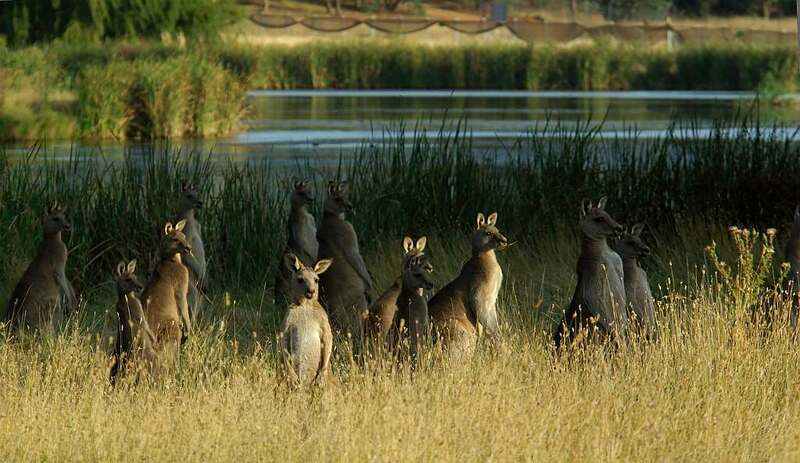 Even those involved in the industry admit that the kangaroo population of Australia has halved from 50 to 25 million in the past five years as the drought has taken a toll on breeding and food sources. Now is certainly not the time to be issuing permits for the killing of kangaroos. Humans have shown that they cannot hunt animals in a sustainable manner. The overfishing of world oceans is illustrative of that. Six kangaroo species are already extinct; with seventeen more species listed as endangered or vulnerable. Australia has the worst record in the world when it comes to animal and plant species extinctions. The kangaroo massacre is the largest massacre of wild animals in the world. Kangaroo shooters kill the largest and physically superior individuals first since they are paid per kilogram. Over time, this weakens the population structure so much so that a smaller, genetically weaker species remains, which reduces the survival ability and strength of the targeted species. Native animals do not exist just to be killed to satisfy the selfish demands of humans but have an intrinsic value and should be able to live as they have done so for millions of years. Killing kangaroos for meat and skin may bring in an income for a certain number of shooters, but it will turn away many tourists who will avoid travelling to a country which not only promotes, but also subsidizes the brutal killing of its native animals. Humane and sustainable industries and high value-added products would make much more money for many more people without killing animals. Tourism, recycling, solar energy and vegan foods are just some of the ways in which money can be earned that do not harm animals. I join many people and organizations from around the world and call on you to stop giving permission for the commercial killing of kangaroos.